There have been a number of questions recently about SMP-FT on Virtual SAN. The Symmetric Multi-Processing Fault Tolerance (SMP-FT) is a feature that many VMware customers have been waiting for. With the release of vSphere 6.0, the SMP-FT capability finally became available. This release did not include SMP-FT support when the VM was run on VSAN however. With the release of vSphere 6.0U1, which included VSAN 6.1, there is now support for SMP-FT when the VM is run on VSAN. Another common question is whether the remote witness appliance for both stretched cluster and 2-node/ROBO deployments can be protected by SMP-FT on a remote host and remote datastores. While this could work in theory, it has not been tested. The general consensus is that vSphere HA should be enough to protect the witness appliance. With this in mind, lets see how one would go about configuring SMP-FT on a standard VSAN deployment. A number of issues are reported in this case. First, one of the nodes in the VSAN cluster does not have Fault Tolerance Logging enabled on any of its VMkernel ports. Secondly, the VM is using devices that will prevent FT. The first is that it has 3D enabled on its video card, and second it has a CDROM device attached. Fix all of these issues before enabling FT once again. 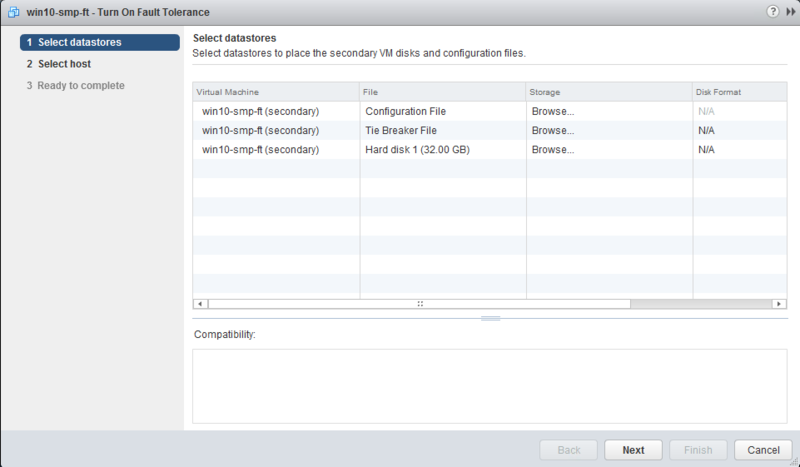 Now when FT is turned on, you are prompted for a datastore to place the secondary VM. And there you have it; SMP-FT now running on VSAN 6.1.